Summer is starting to wind down here. Big J started back to school on Monday. We are squeezing in all the summer fun we can while the temperatures are still nice; but, for the most part, another summer is behind us. I’m starting to get things put away from summer and getting things ready for autumn… hello, pumpkins and apples! 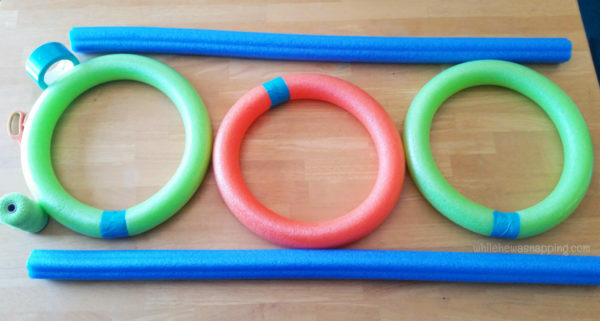 We had some pool noodles we played with this summer, but I don’t really want to try to keep them in good shape for next year… they were only $5 for the lot of them and I value the space they’d take up more than that. So, I decided to create a DIY Toss Game with them. When we’re done with this game, we’ll just toss them – or use them as swords. I can pretty much guarantee that will happen. 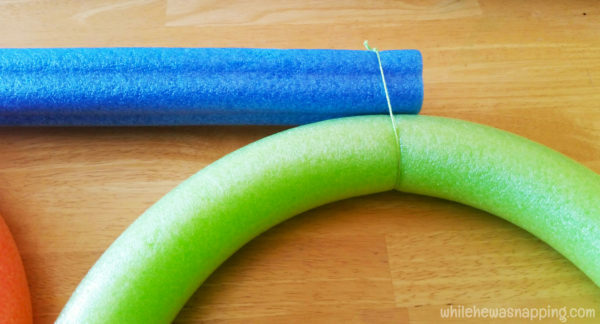 So, looking for something to do with all those pool noodles after pool season? – Bend one of the noodles into a circle, so that the ends are touching. Tape them together with the duct tape. 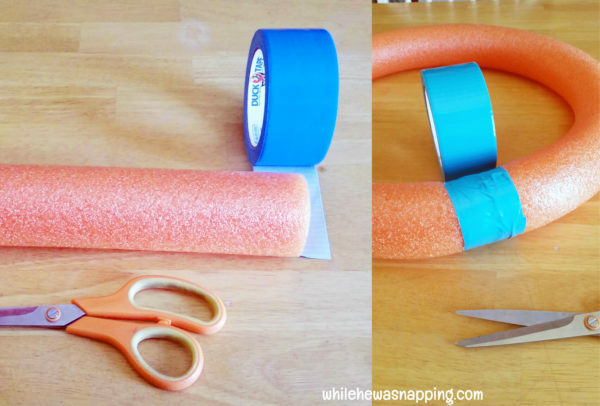 It might help to have a second pair of hands hold the noodle while you tape it together. – Repeat the first step two more times, so you have a total three circles. – Take your three circles and lay them on the floor next to each other so they form a line of circles. – Place another noodle on opposite sides of your circle line. Make sure the bottom of your lowest circle doesn’t hang out lower than the end of your straight noodles or it won’t stand up well. 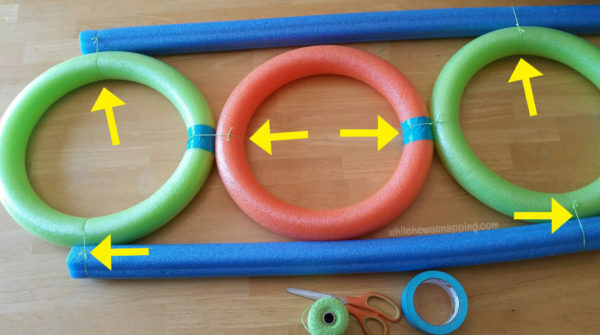 Use string to tie the circles to the straight noodles. If you want a more permanent (and slightly sturdier) game, you can tape them on. I wanted to be able to take it apart without ripping the noodles up though. – Once everything is all secured, take the dowels out and stick them in the ground. You’ll want to take the noodle rings with you to measure the distance between the dowels. Our dowels were part of an old toy bin shelf contraption-thingy. We dismantled it and just used those, but they were about a 1/2 inch diameter stick on each side. Double check the holes in your noodles if you aren’t sure what size will work best for you. You want it smaller than the diameter of the holes in the noodles. – You’re ready to play. You can set up whatever rules you want to. Make each ring a different score, or just see who can get it through. 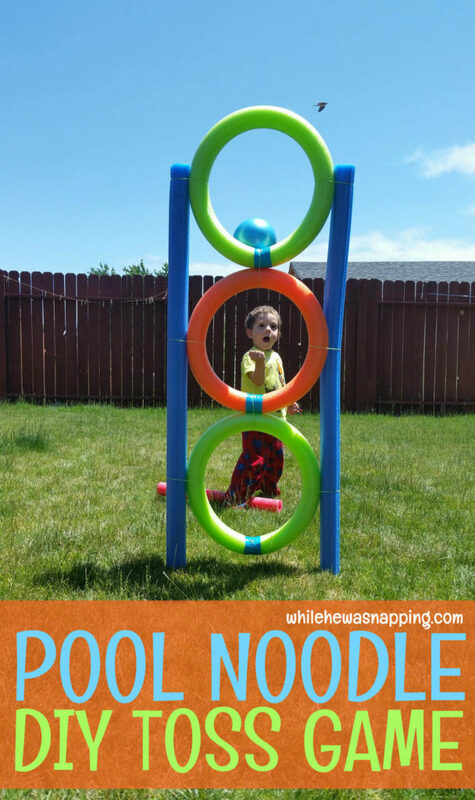 Super easy and we’ve had this DIY toss game up for about a month. 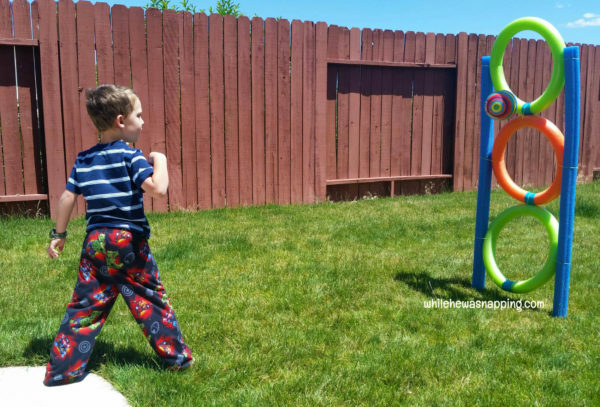 It’s a great activity to send the boys outside to play while I’m finishing up dinner prep or when they are just driving me crazy. Even Baby N will play… not always like his brothers want him to, of course. 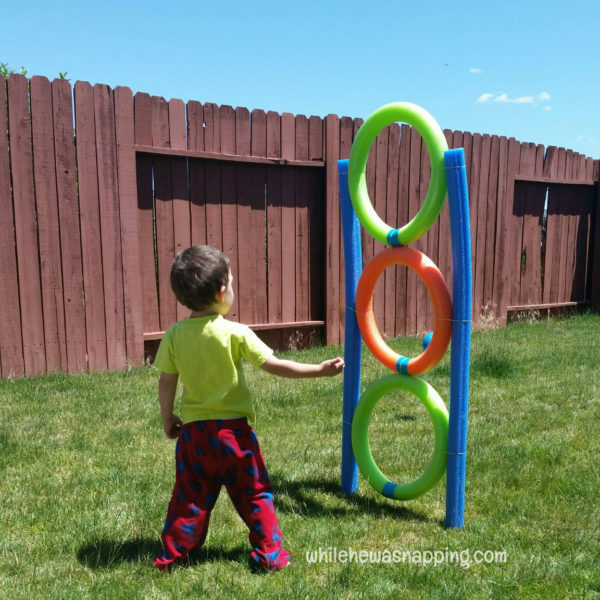 It’s a fun game to play with friends and I love that we can pack it up easily and take it to the park with us. Hi, We are 6th grade boys who are working on a 4-H working exhibit and are going to do ours on eye hand coordination games. We saw your cd mazes and were wondering if you would allow us to use your idea for this project. It will be done at our state fair in Iowa. If you could just email us giving us permission to the email address given we would have a copyright of it for our project. Thanks Bev! I hope you guys love it!